Truly, my hubby makes me laugh just because he is so ridiculous at times. Having the ability to look at everyday things and see something funny and to have the ability to let go of his pride and do something silly to entertain others is a gift. Sometimes its not even others, he could be just entertaining himself and you've caught him out. There are times when i wish i could let go and do the same. 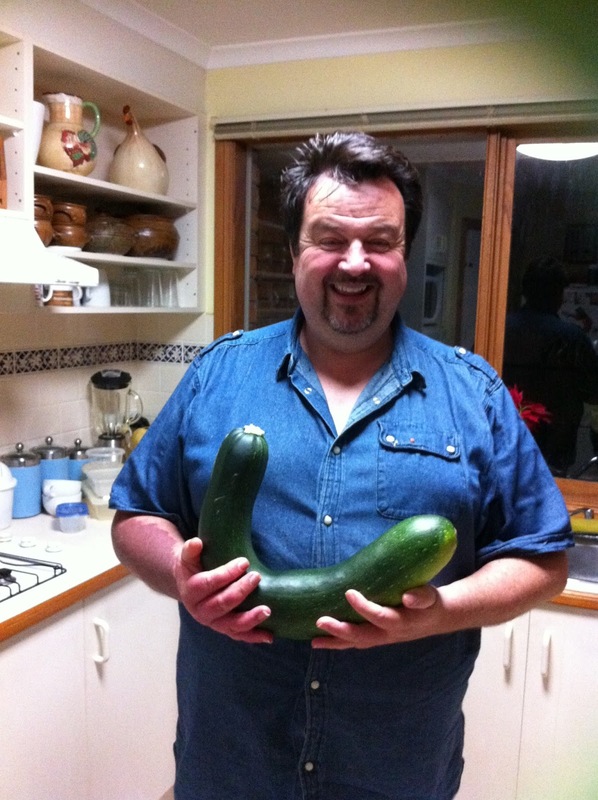 While mucking around in the veggie patch tonight, I know its a miracle, he was pruning the o-so-spiky zucchini plant that had grown over the edge of the raised bed and had spread itself across the grass. Not wanting to disturb the plant we've just been mowing around it but it was getting out of control so he lifted up a large leaf and found this monster resting on the ground cradled by a thick patch of long grass. It had reached the ground and kept on growing around. For some this might not be so surprising but for new gardeners, this family has been gobsmacked and amused. So much so that we had to take pictures. Next thing you know its attack of the killer zucchini. It has kept us laughing most of the night and it sits over there on the kitchen bench making us giggle like young children. Like Ive said before, sometimes the nourishment we need isn't food. 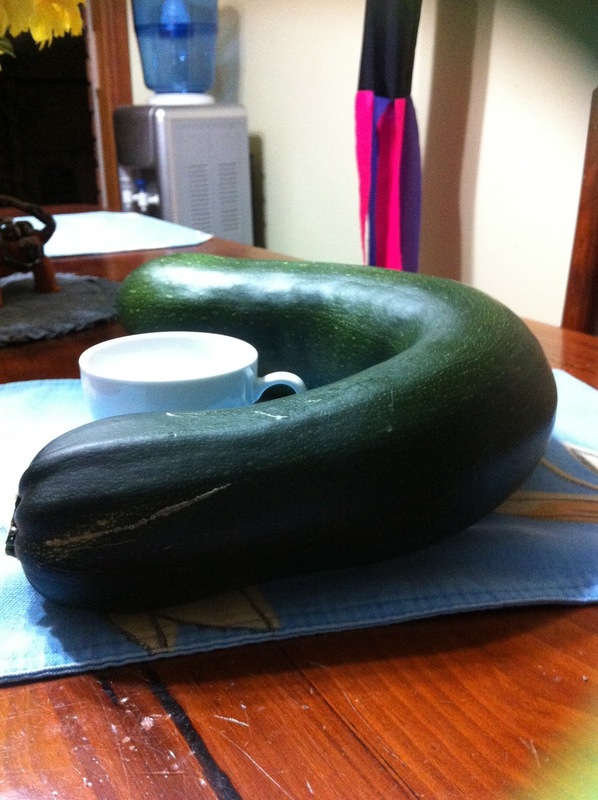 Though I'm trying hard to think of zucchini recipes to make food out of this one. I'm a bit sick of slice. Any idea's? At this size im sure it will need lots of flavor added. PS. I wrote the above in the middle of a sleepless night (as usual) and so i made sure he was OK with me putting the pictures on the blog. He seemed chuffed and reminded me that it was British humour (he's from Yorkshire). Phew, for a minute there i had visions of my OS readers thinking he was Aussie. I can relax now - national pride intact. Hmmm...why is "Attack..of the Killer Tomatoes" theme song in my brain?!?!?! LOL We had a cucumber that hid for a long time and was quite...Ahem...large and made us giggle a lot (probably too much!). Wow, that IS a monster. Um, recipes. Zucchini bread, choc chip and zucchini cake, rattatouille (my favourite way to eat zuccs), grated into fritatta or omelettes or do what I did and grate the sucker, separate into manageable amounts and freeze. I've been the recipient of over 15kg of zucchinis this season and I've already pickled a goot 5 (piccalilli), used heaps and I am not a fan of them with which to begin so there had been about 5 or 6 more kgs in the fridge for too long and we lost a few to the chooks. 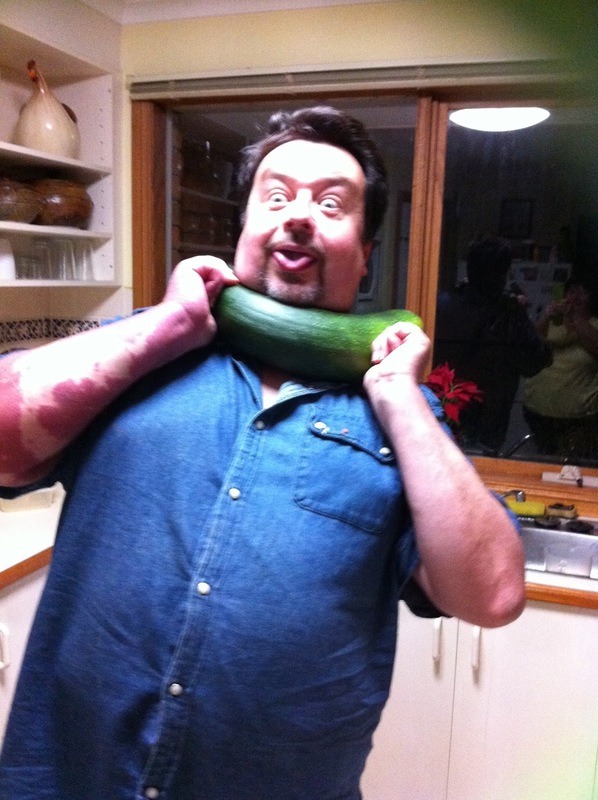 The rest provided 2.8kg of grated zucchinis in lots of 400g. I can snap one of them in half and chuck it into spag bol or a chocolate cake, get goodness into the kids (and I) without having complaints about the taste.